Plans for the new Master Plan of the Presidio of Monterey include two locations, the Presidio of Monterey (POM) and the Ord Military Community (OMC). Improvements focus on modernizing or replacing aging classrooms and dormitories and improving transportation circulation within the POM. The project applicant is Department of the Army. 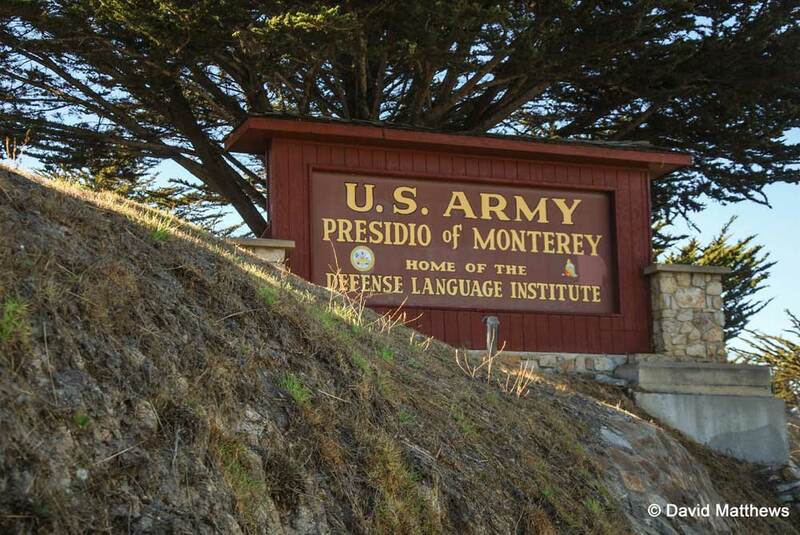 The project would modernize or replace existing classrooms and dorms and improve circulation. The Department of the Army is the lead agency. Public meetings were held in May and June 2011. The Army completed an Environmental Impact Statement. An expected update is coming soon according the Army’s website. 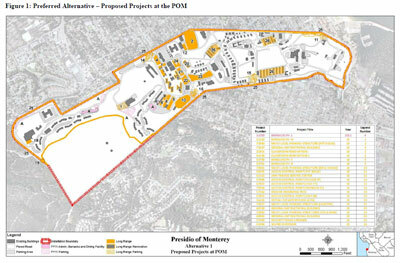 This map shows the details of the Presidio of Monterey project. 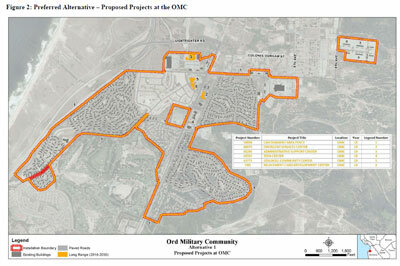 This map shows the details of the Ord Military Community project. While the DEIS includes extensive discussion of Greenhouse Gas Emissions (GHG) and related regulations, it fails to include an analysis of the impacts of the project’s GHG emissions on climate change even through the long-range daily CO2 emissions are estimated to be over 12,000 lbs/day. The DEIS finds there would be insufficient water available for the POM-centric alternative. Mitigation measures include water transfers from the OMC to the POM or water from the RUWAP or the Regional Project. A more complete evaluation of the availability of water for the long-term project should be included in the FEIS. Mitigation measures were identified that would reduce traffic impacts to less than significant. The FEIS should identify the feasibility of implementing these measures and the schedule and funding for each measure, e.g., Del Monte Widening Capital Improvement Project.